YOKOHAMA - Radamel Falcao scored a 64th-minute penalty as Colombia got a measure of revenge on World Cup foe Japan in a 1-0 international friendly victory on Friday. 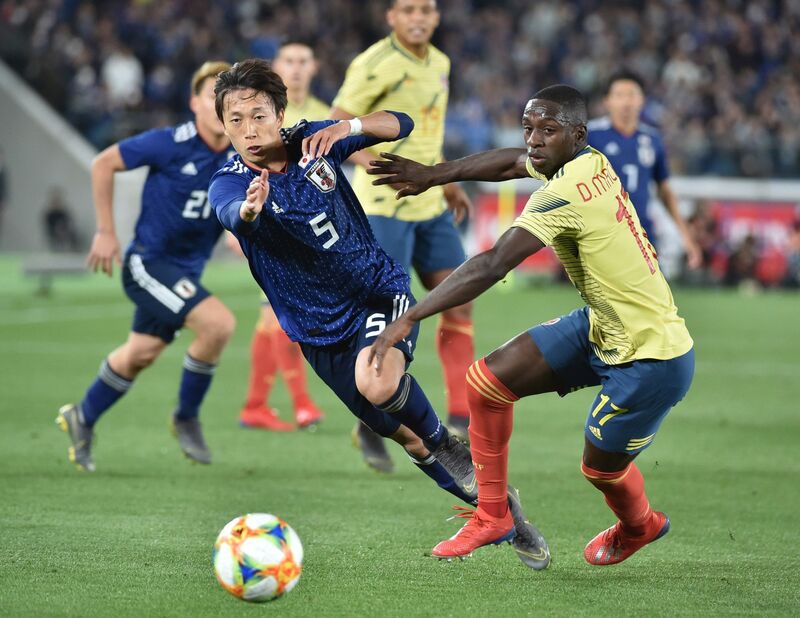 In a rematch of their opening World Cup Group H match last year, the Samurai Blue started just two holdovers from their 2-1 win over 10-man Colombia in Saransk — midfielder Gaku Shibasaki and center-back Gen Shoji. Meanwhile Los Cafeteros, in their first match under Portuguese manager Carlos Queiroz, retained a handful of veterans from the World Cup clash, including star attackers James Rodriguez and Falcao. The 66-year-old former Iran boss Queiroz has been tasked with rebuilding the Colombian side following the departure last year of longtime manager Jose Pekerman. Samurai Blue boss Hajime Moriyasu gave 25-year-old Consadole Sapporo striker Musashi Suzuki his first senior cap, starting him at Nissan Stadium in front of the attacking trio of Shoya Nakajima, Takumi Minamino and Ritsu Doan. Kashima Antlers defender Koki Anzai, 23, and Sint-Truiden attacker Daichi Kamada also made their debuts as late substitutes. 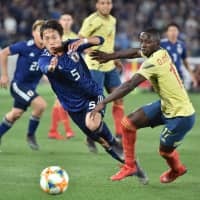 Japan looked to hit on the counterattack early in the match, the first of two tune-ups against South American opposition ahead of the Copa America starting in June. The hosts had an early escape when Sebastian Villa hit the bar on a cross from Luis Muriel in the opening minutes. While the South Americans had roughly 60 percent of first-half possession, Japan looked much more dangerous with the ball and should have taken a lead into the break after missing the target with a number of good opportunities. Despite the windy conditions, the home side used aerial passes to good effect early, with Nakajima and Shibasaki opening up the Colombian defense with balls over the top to the wings. Doan had a close-range shot blocked in the seventh minute, then fired just wide of the upright from the top corner of the box 10 minutes later. The Groningen winger was just off target again in the ensuing play, as the Samurai Blue looked increasingly threatening. With Japan quickly turning defense into attack, Nakajima grazed the top of the bar with a long-range effort that just beat the outstretched glove of Colombian ‘keeper Camilo Vargas. Suzuki showed his value early, winning an aerial challenge and laying off for a streaking Doan, who subsequently set up a shot on goal for Minamino. Colombia came out more energized in the second half and immediately took the attack to Japan. Falcao appeared to have found the net on the breakaway in the 48th minute, but the goal was waved away following a foul in the lead-up play. The Monaco striker stepped to the spot in the 64th minute when Takehiro Tomiyasu was penalized for a handball while blocking a shot from substitute Duvan Zapata. Goalkeeper Masaaki Higashiguchi guessed the right way, getting a hand to the ball, but was unable to stop Falcao’s shot to the top corner. Winger Muriel won a corner following a storming run down the left, then looked to have scored from the subsequent set play, but the offside flag was raised. Veteran midfielder Shinji Kagawa elicited a huge roar from the stands when he entered for Suzuki in the 65th minute, and the Besiktas attacker, playing his first international since the World Cup, was heavily involved the rest of the way. Nakajima went inches from an equalizer with seven minutes left, hitting the woodwork from the edge of the box. With time ticking away and both managers going to their reserve benches, the game became an increasingly frantic, end-to-end affair, with both teams creating chances. Moriyasu praised his side, singling out the newcomers for their efforts but said the team needed to be more clinical with their chances. The Samurai Blue will take on Bolivia at Kobe’s Noevir Stadium on Tuesday in the second of two warm-ups for the Copa America.